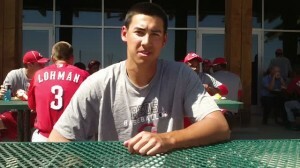 In a 2013 season in which he has baffled hitters in a talent-heavy Midwest League and risen to the status as the top prospect in the Cincinnati Reds organization, Robert Stephenson has been placed on the disabled list with what is being called a strained hamstring, which he recently suffered while running in between starts. Coming into the season, Stephenson was ranked second behind outfield prospect Billy Hamilton as the top prospect in the Reds organization by both Baseball America and MLB.com; however, a lackluster season for Hamilton who has struggled offensively and failed to regain the same electric speed that was present in his two previous seasons in the minors, has allowed the right-hander to rise in stock with a strong season at Low-A Dayton. In 12 starts this season for the Dragons, Stephenson has posted a 5-3 record and 2.97 ERA to go along with a strong 85/17 strikeout to walk ratio that suggests good control of his pitches, a plus feature of his game that he has showcased in his first two seasons in the minors. A WHIP of 1.035 accompanies his impressive stat line, all of which he has accomplished in 66.2 innings of work. In his most recent start on June 8, Stephenson dazzled in 7 1/3 scoreless innings, in which he surrendered just three hits and fanned eight batters while walking just one. A first-round pick (27th overall) in the 2011 MLB June Amateur Draft by the Cincinnati Reds out of Alhambra High School (California), Stephenson has been projected to be a future front of the rotation starter, something the Reds have been in search of for quite some time as Cincinnati has struggled in maintaining a consistent rotation in recent years. Stephenson has a strong three pitch arsenal, highlighted by a plus fastball that has ranked amongst the best in the minors and a curveball-changeup combo that has developed into a possible plus offering. His timetable for a return is unknown at the moment, but due to the fact that the injury is being called a strain suggests that such should not be serious and as a result, Stephenson should be able to return in a timely fashion. With the Cincinnati starting rotation performing solidly at this point in the season (with four starters boasting ERAs under 3.50) and rookie southpaw Tony Cingrani recently returning to the rotation, Stephenson will most likely not be rushed and needed at the moment. However, once he returns, look for Stephenson to move quickly throughout the minors as his skill level can be argued to be at a higher level than Low-A ball.